One of my favorite web browser additions is Inquisitor, a search enhancement tool for Safari and Firefox. On the desktop, Inquisitor simplifies and speeds up Google and Yahoo searches by predicting search terms and listing top results inside the browser’s search bar—and it does this with style. Now Inquisitor has come to the iPhone, and Yahoo’s mobile offering is one of the sleekest search applications available. 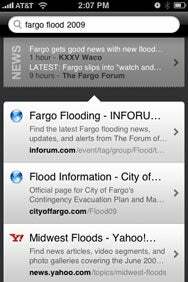 Find It Fast: While the mobile version of Inquisitor has many of the same tools as the desktop search enhancement tool, the iPhone app adds news stories to your search results. Many features from the desktop version of Inquisitor translate well to the iPhone version, including predictive searching, tracking visited sites in result lists, and a clean and easy-to-read interface. However, Inquisitor for the iPhone adds several features not present in the desktop version, most notably the inclusion of news in search results and a search history. Inquisitor also uses the iPhone’s accelerometer to “shake to clear” search terms, which is handy, though not essential. Most important, Inquisitor is fast—getting results and reading information is nearly as quick as a desktop search; it’s certainly faster than using mobile Safari. Even though mobile Inquisitor is a great application, it still has room for improvement. Unlike the desktop version, there is no way to switch or add site-specific search engines (such as Amazon or IMDB) to Inquisitor. Additionally, power searchers might wish to control how many search results are displayed. These are relatively minor complaints, though; overall, Inquisitor for the iPhone is a must-have for users who need to quickly look up information on the go. Inquisitor is compatible with any iPhone or iPod touch running the iPhone 2.x software update.